First off, thanks for all the congratulatory love for my half-marathon. I don't know if you noticed but toward the end of my race report I tossed out a goal for next year of finishing in under 2 hours. Is it too late to backpedal? I'm not saying I'm giving up that goal, it's just a little early yet. That would mean around a 9 minute mile pace. I want to see how the rest of this racing season goes first. I think my excitement got the best of me. Which isn't a bad thing entirely, right? So yesterday I had a plan to go to the gym but it fell apart. That was fine because it was just the day after the half and I figured my body could use some rest. Today I had a plan to go after work but just before I was ready to go my buddy Michelle texted to see if I wanted to go to The Dailey Method with her. Why not? My legs are still a bit sore and I was suffering from a bit of low motivation so going with a friend would be nice. The workout was good. The sets involving leg stuff was a challenge and my hips hurt a bit with some of the harder moves but I made it through. The upper body stuff was nice but I miss my heavy weights. I need to get back into my gym soon, it's been WAY too long since I've had one of my normal workouts. My muscles are going to be hating life after the first go 'round, they've had quite the rest. Speaking of my gym, I passed by today and guess what I saw in the window? You are going to be sick of this picture by the time I get done. There's a lot of reflection but worry not, I'm going to take another one with the gym owner, Mark, and of course post it here. I was taken aback at how big it is. It's larger than life. I couldn't stop giggling. So the other thing going on is that Miguel is going to be away for a while somewhat unexpectedly. I'll be running the house solo, which will keep me a bit busier than usual. The only thing I really need to figure out is how to get my Sunday outdoor-time scheduled. I thrive off those couple/few hours of outdoor activity. I feel like I need to go for a bike ride after all this running. Maybe a mountain bike ride, I haven't been on my mountain bike in...years? It's been a while. Other than that it means I get to go to the grocery store with both kids, which is always an adventure. Toddler wrangling, not for the weak spirited. Actually with Marek being almost 4 things like that have gotten a lot easier. So tomorrow is a rest day, I'll be home with the kids. I have some plans for my new career stuff but otherwise I'll be laying low. And trying not to eat my way through the pantry and fridge. I've been on a carb mission lately and I don't seem to want anything else. My raw veggies are so unappealing, I'm not wanting cooked veggies much either, meat doesn't sound good. Carbs and salt, that seems to be all I want. Anyway, I've been watching bad TV and munching on smoked almonds while I write this post. I have to wrap it up or I won't stop eating the almonds! Night all. Good luck with running solo at the house for a while. Hopefully the time goes by fast and relatively easy! If I were closer I'd offer to watch the kids while you had your me time on Sundays....however, I think MD and CA are just a tad too far apart for that kind of thing. 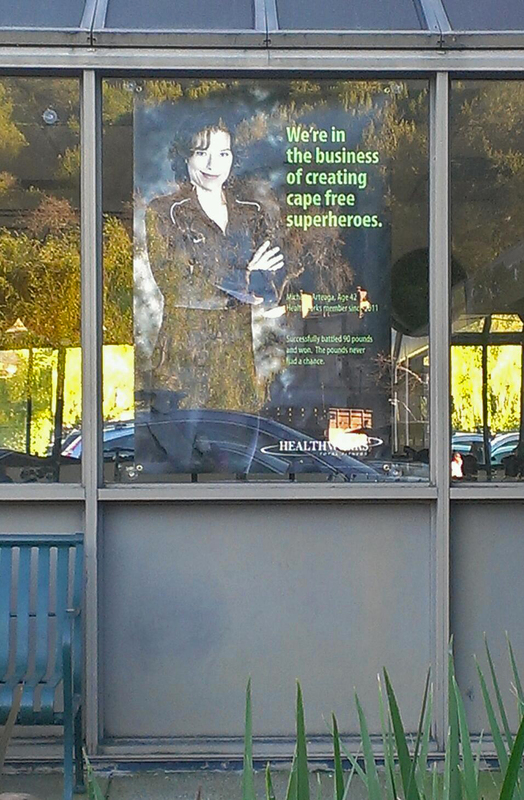 And I'm just smiling as I imagine your thrill with seeing your picture up in the window of the gym! Thanks MaryFran, yep, that's a long drive over :) And I couldn't stop laughing to myself when I looked at the ad in the window. It's unbelievable to me. I have been catching up on your blog -- that picture of you is just gorgeous! I like the expression on your face. I really am impressed that you keep up your Tri training with two toddlers. Ah you must be SO THRILLED to see that big ole poster in the front window! !